If you’re going to wear the collection of sneakers you’ve fought hard to acquire, you’ve got to keep them looking clean and fresh day in and day out. And if you aren’t privy to tricks of the trade, allow us to help you out. Tarrago Sneakers Wipes are freshly scented cleaning wipes to remove dirt from your sneakers instantly. The package is specially designed to be carried comfortably in your pocket, in a bag, in a backpack or in a suitcase; and its easy application, you can use them at work, after practice sport, in the street or travelling. Enjoy your clean sneakers whenever you want! Tarrago Sneakers Wipes are the ideal shoe cleaning essential for that on the go lifestyle. The ultimate solution for quick effective cleaning at small particles, continuing to clean long after wiping your sneakers. It’s suitable to use on all materials including canvas, leather, suede and nubuck. Our premium shoe cleaner wipes are dual-textured and designed to provide you a full cleaning all in the convenience of a wipe. You can use the smooth side for regular cleaning and the dotted side for the stubborn stains. 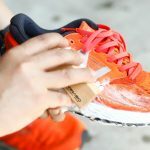 How to use Tarrago Sneakers Wipes? 3. Recycle the packaging when done.